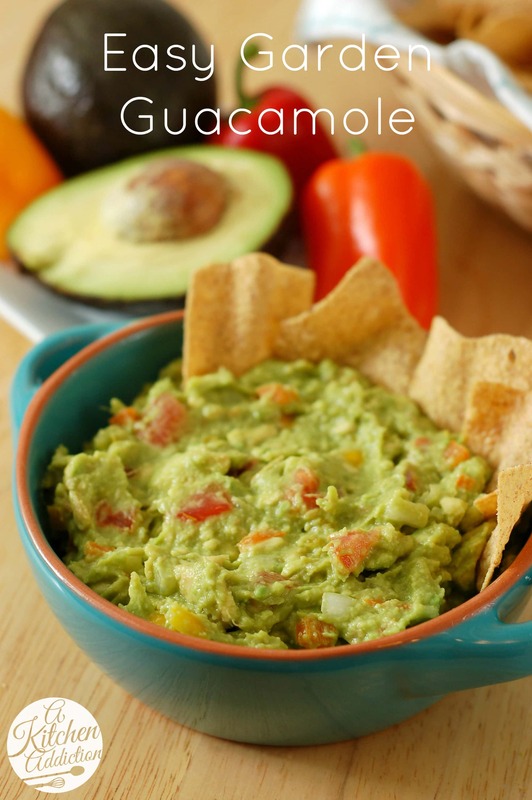 This Easy Garden Guacamole is loaded with fresh veggies and a hint of heat! Super easy to whip up whenever you need something to snack on! Since I covered healthy dessert Tuesday, let’s cover a healthy snack today! I can always snack on guacamole. It’s easy to make, and it’s packed with nutrients. I love trying different variations and some of my favorites are those that are full of veggies. I like the texture that fresh peppers and onions provide. So, this version of guacamole is loaded with peppers, onion, and tomato! 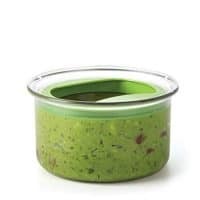 I’ve been wanting to make guacamole ever since getting back from Florida, because one of the items in our swag bags from Food Blog Forum was a 3-in-1 avocado slicer from OXO. Normally I don’t like to have lots of little gadgets in the kitchen taking up valuable space in my small drawers, but this is one gadget that I’m keeping! It has a plastic blade that is perfect for cutting the skin of an avocado without worrying about a sharp edge that you can cut yourself on. 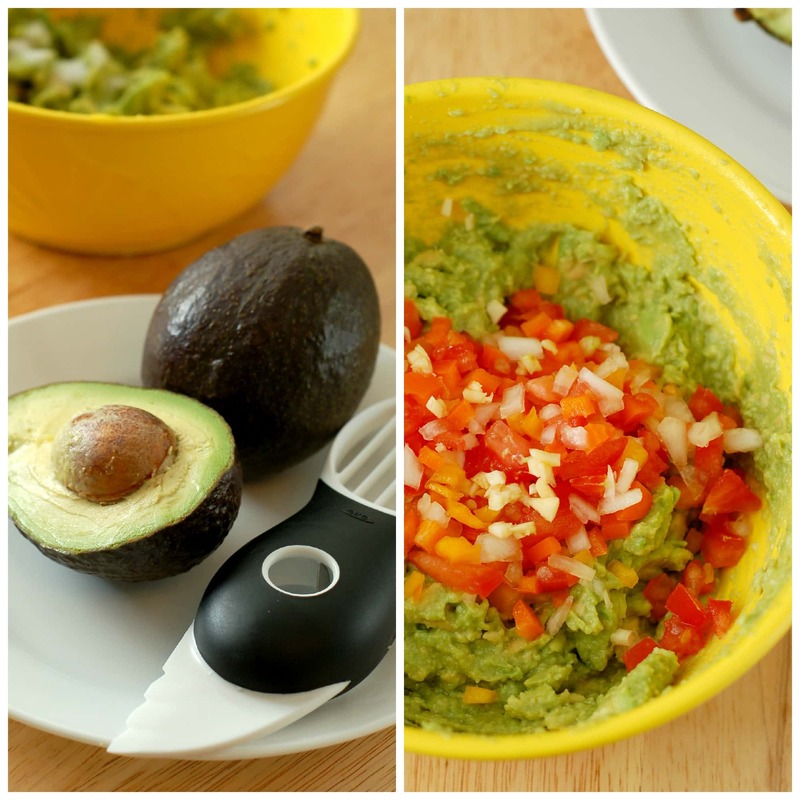 Even if you don’t have a 3-in-1 avocado slicer that needs to be tried out for the first time, you still should try this guacamole. It’s a perfect snack to use all of the fresh produce that is starting to come out in abundance. The sweet peppers give the guacamole a hint of heat and a flavor that is different from traditional guacamole. 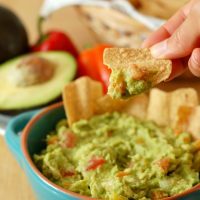 So, the next time you need something to snack on without overloading on sugar and fat, quick whip up a batch of guacamole! Gently mash avocados, lemon juice, and olive oil together with a fork. Stir in garlic, peppers, onion, tomato, salt, and pepper. Serve immediately or (if you can wait) allow guacamole to sit for 15 minutes for flavors to blend. Mmm, this sounds so healthy and delicious! Definitely keeping this on the rotation for summer. I love guacamole with added veggies! Especially the tomatoes and onion. This is summer food! So perfect! I used mine this week too and LOVED it! 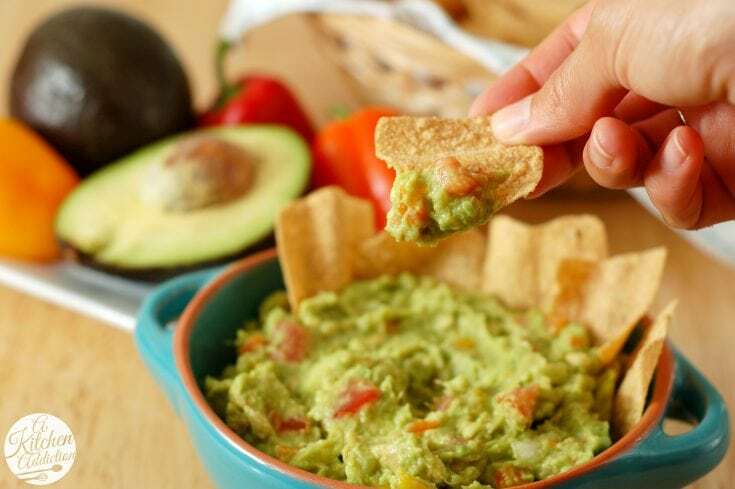 Guacamole is one of my favorite snacks! I don’t make it nearly enough. 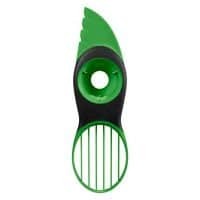 I love the OXO avocado slicer. I like this guacamole even more. Guacamole is my favorite appetizer. It’s so fresh and satisfying. Yours looks so great with those peppers as well as the chunks of tomato! Oh how I love guacamole! I could probably eat it every day! My hubs doesnt like it though 🙁 I guess more for me!! Love an easy guacamole recipe!! So fresh and looks delicious! Guacamole is my faaaaavorite. In fact, I think I’m having it for dinner tonight. I love this one! Well that’s a nifty gadget! I could eat avocado’s everyday! I can eat copious amounts of guacamole! I love, love avocados! I love all the peppers in this dip! Gimme a margarita and this gorgeous guacamole, and I’m SET. Love that you added sweet peppers and lemon juice – two things that don’t usually end up in my guac. Trying it next time, for sure! I never can enough guacamole in my life! This version looks so fresh and bright – just lovely! oh how i love guac…i just planted some sweet pepper plants so will be fun to use in your recipe! This looks fabulous. I’ve never had an avocado or guac…this is almost embarrassing to admit! I need to get on that soon! I could eat guacamole of any kind every single day for the rest of my life! mmmmmm your guacamole looks amazing!! Mmmm…guac is SO good. I want an avocado slicer! Hope you don’t mind, but I’m planning on face planting that bowl of guacamole. No shame! This dip looks absolutely beautiful! I make a very similar guacamole actually, but I sneak in heaps of chilli and lime (being a bit of a heat freak!). Love the idea of a ‘garden guacamole’ also. Definitely fresh, delicious and nutritious! I just made guacamole earlier today. Yours looks great , love the fancy avocado slicer! I love that you added olive oil! I’ve never tried that before. LOVE that garden guacamole! 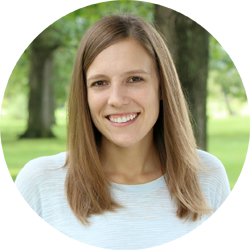 Thanks for hosting Karly! I will have to check out that avocado slicer. But will make this guacamole regardless. Avocados are just fabulous! Mmmm, I love the idea of adding sweet peppers. So fun!